Fun and silly fall and autumn games that will keep kids happy and entertained for Fall parties. You'll also find the link to our Free Thanksgiving theme scavenger hunt list! Play this Fall game inside or outside. Play individually or in teams depending on how many party guests you have. Birthday guests roll ears of dried Indian corn along the floor with their nose from the starting line and then back again. They can't use anything but their noses to push or roll the corn. Fun! Played like freeze tag. The party guest who is "it" tries to tag the other guests. When tagged the child must hold still and "gobble" until another child comes and touches them - then they are unfrozen. When "it" gets everyone tagged and frozen they get to pick the next "it". Fun and active game that needs nothing to play. The "Great Pumpkin" or leader calls out silly actions for the players to do. The last person to do the action is out of the game. (Or play without eliminations by changing the leader during the game). The actions (listed below) are done individually, in pairs of 2 or groups of 3 or 4 which is determined by the explanation. Go over the actions before the game so that the players will know what action to do for each command. Group of 3 - Two players sit and make a table while the 3rd player pretends to eat. Players get on the ground in a ball like a pumpkin. Players jump up and then float to the ground like falling leaves. Group of 4 - Three players bunch on the ground into separate piles of leaves, 1 player to rake the leaves into one pile. All players squat down and flap their arms and move to the right side of the room. Players pretend to run and then jump into a pile of leaves. All players flap their wings and run to the left side of the room while cawing. All players stand tall and place their hands around their face like a sunflower. The first person to jump up and down waving their arms becomes the new Great Pumpkin. Teams try to be the first to fill up their container with seeds. Divide players into two teams. At one end of the playing field set up two empty clear plastic containers that are equal in size (try to find containers that have a small opening at the top). At the other end of the playing field set up a large container filled with sunflower seeds or deer corn. Give each team a small plastic cup or large spoon. The players one at a time on each team must fill up their cup / spoon and then run to empty it into their container. Then they run back and hand off to the next person on their team. Play continues until one of the teams containers is full. 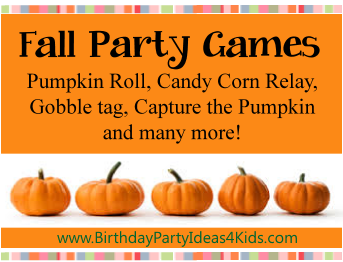 This fun party game is played like a Cake Walk with a Autumn theme. Write numbers from 1 - 30 on separate pieces of red, yellow and orange construction paper (cut the paper into fall shapes: pumpkins, turkeys, corn ... or leave them as rectangles). Tape the numbers down and arrange them in a large circle (or oval) on the carpet or floor leaving at least 10" of space between the numbers. On a separate sheet of paper write down the numbers (1 - 30) and cut them into squares - one number per square. Fold the small numbers and place them in a decorated container. Start by having the kids stand on a spot in the large circle. Tell them that when the music starts they are to begin walking in a line around the paper circle stepping on the numbers as they go around the circle. When the music stops they have to stop and stand on top of the number closest to them. (A variation is to let them choose to stay where they are at or run to another empty number). Then a number is chosen from the container and the child who's number is called wins a prize. Variations: Play this near the party's end and let the goody bags be the prizes. After a number is called remove it from both the circle and from the container so the number won't be called again and the circle gets smaller - this makes the game move a little faster and there. Each player gets 1 leaf and 1 plastic drinking straw. The object of the game is to see who can move their leaf across a table or designated area the fastest by using the straw to blow air on the leaf. Traditional birthday party game, but instead pin the tail feather on the turkey! It's just plain bowling with a fun - and messy - twist! Boys love this birthday game! Set up pins (anything that can be knocked over - empty 2 liter bottles work great) and about 30 plus feet away. Then the kids roll, throw or toss the pumpkins at the pins to knock them down. Tip: After the mess have kids pick up the seeds (and pumpkin pieces) and use them in a pumpkin seed spitting contest. This is played like hide and go seek (the squished sardines version). One person counts and the other birthday guests go hide. The twist is that the hiding party guests must look for each other without getting caught by the "seeker". When two hiders find each other they must then hide together. Play continues until all the hiders are hiding together. If they can all hide together without getting caught then the seeker is "it" again. Fun birthday party game for kids of all ages! Set up an obstacle course (this game is best played outside) that the birthday guests will have to maneuver a pumpkin around by rolling it. Set up obstacles that the kids will have to go over, around, through and under. Gather up several intact pumpkins - you may need a few extra in case of "breakage". A fun activity for kids and families of all ages! 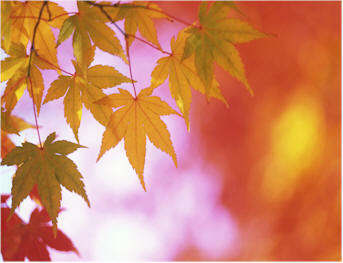 Search for the 38 Thanksgiving / Fall themed items from our FREE scavenger item list! Make fun Indian bead shirts for a party activity. Buy inexpensive t- shirts - big or small (girls can wear larger t-shirts as dresses). Cut the sleeves and bottom of the shirt into fringe about 2 - 3 inches long. String large plastic multi colored beads on each piece of fringe - then knot the shirt at the end so the beads don't fall off. Fun and festive! Fill a glass container with Indian corn kernels and guests have to guess the number of kernels in the jar. Closest guess to the actual number gets a prize, or gets the first piece of birthday cake! Instead of carving pumpkins - have a decorating contest and decorate them with yarn for hair and draw on features with colorful permanent markers. Add hats, sunglasses and earrings!